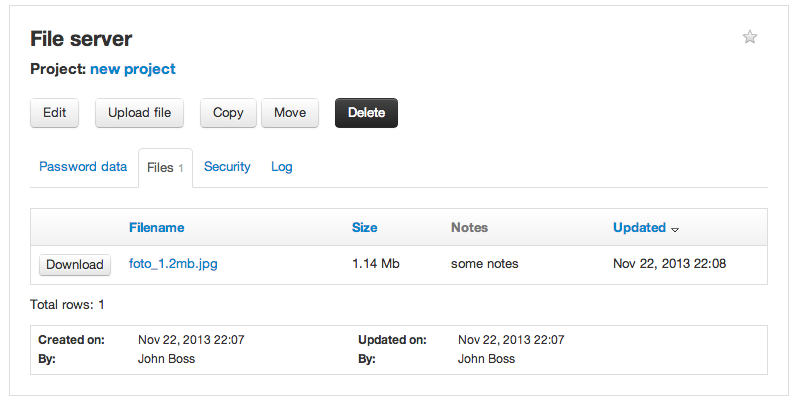 Today's release has a feature that lots of users have been requesting: files in passwords and projects. We've created a document explaining everything about files in Team Password Manager, check it out: Doc: files in passwords and projects. We've also corrected some bugs (specially with the copy to clipboard feature) and added a few things. Check the changelog to see it all. * Note: if you're upgrading Team Password Manager from previous versions you'll need to create an uploads folder (or copy it from the installation files). Take a look at the how to upgrade doc. The HTML5 Clipboard API is only partially supported in most of the browsers. We'll follow this closely since it seems the most promising solution in our opinion. Some browsers (Internet Explorer) have a way to access the clipboard, but this is not available to all the browsers we support. So, right now, the best way we've found to access the clipboard is to use a Flash. We know it doesn't work in iPhone/iPad, but it's the price we pay for better compatibility across desktop browsers.